Three short news items in this no-post week. King Willem-Alexander and his wife Máxima cycling in New York on orange bicycles during a state visit. 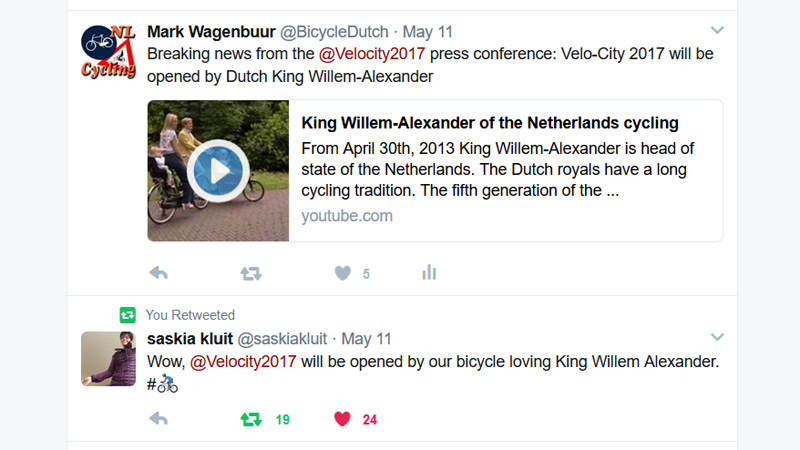 King to open Velo-City 2017. You could read it on Twitter first. This news was picked up quickly and you could read about it all over the internet. But I can add a little fact to all that, that I haven’t seen published yet. After the opening ceremony in Nijmegen, His Majesty King Willem-Alexander will also cycle a part of the high-speed cycle route from Nijmegen to Arnhem! The king has cycled all his life and so have three generations before him. His children cycle too. This gives me the opportunity to show you a video again that I made when King Willem-Alexander took the throne from his mother Beatrix, in 2013. A video about the cycling royals of the Netherlands. 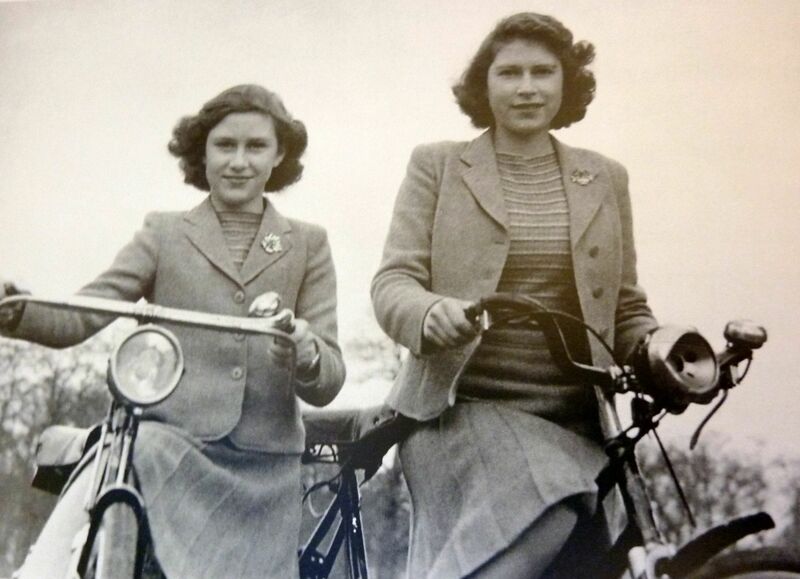 The Dutch royals are no strangers to cycling. How is it possible that mandating cycle helmets leads to a decreased general road safety? That was one of the questions in a test for over 60,000 students last Friday. In the Dutch educational system schools don’t test their own students. All students must take the same state exam. These – mostly 16-year-old – students were tested for the subject “Dutch” in a school type that prepares them for vocational education. To test if they fully understood an argument in a Dutch text, they were asked to map causal links between Mandatory Helmet Law and a decreased road safety. The quote in the text is from the very influential Cycling Professor Marco te Brömmelstroet. The actual answer sheet looked like this. This national exam question also gives a nice insight into how the Dutch generally think about mandatory bicycle helmets: Not good! The above text argues that mandating bicycle helmets causes a decreased safety. Place the numbers 1, 2, 3 and 4 in the correct sequence of cause and effect in the schedule on your answer form. the idea that cycling is not safe. road users who do not consider cyclists. The bicycle helmet becomes mandatory. You can find the correct answer at the bottom of this post. You have seen it already in my post a few weeks ago, but now it was also officially opened. Dafne Schippers (24), the athlete from Utrecht, came to the bridge bearing her name, to open it with a whole lot of Utrecht school children. Very appropriate since this is the bridge on top of a primary school. We now also know what Dafne herself thinks about the bridge. In a bilingual tweet (that also makes clear how incredibly similar Dutch and English sometimes are) she called it “Zo cool!”. 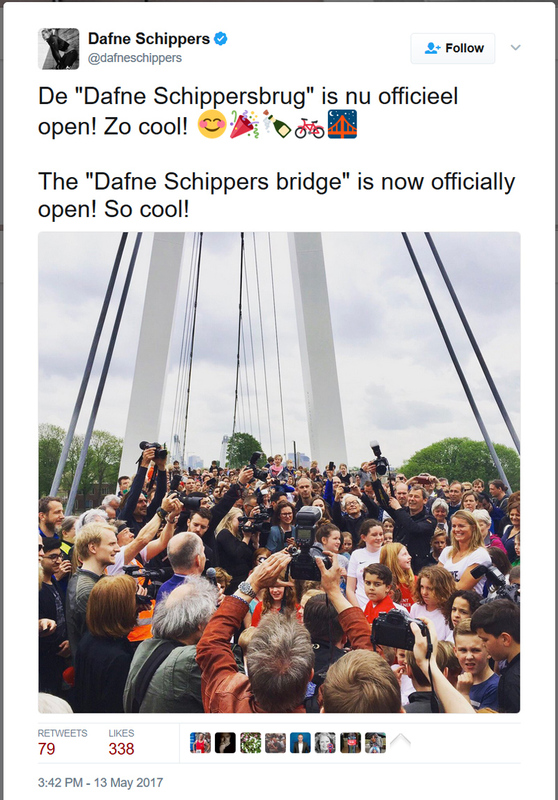 Proud tweet from Dafne Schippers herself. She is smiling in the right of the picture. The city of Utrecht posted a short drone video, showing that “cool” really is the word for this bridge! Short drone video showing the Dafne Schippers Bridge. A day after the official opening Stefan Wapstra posted a video with images of the opening day combined with drone shots taken during the construction phase. The opening and construction of the Dafne Schippers bridge. The correct sequence of cause and effect is: 1, 3, 2, 4. Dutch education is characterised by various streams in both Secondary and Tertiary education. Vocational (VMBO), applied (HAVO) and pre-academic (VWO). This question is for the Vocational stream in Secondary education. I can’t believe such an obviously easy question was put on a national exam. Do you know what percentage of students got it wrong? To test if students can think for themselves (which is part of what real education should be about) a question should be like: Do you believe the above premise is correct? If not why? The question is not meant for testing thinking for oneself, but for testing reading, understanding and analyzing a written argument. You give students questions that contains the answers – most students get it right – the school gets more funding – the school is now able to give more bad education so they can keep their funding – the students and society lose. First, this is a ‘central exam’ question, which means that all students in the Netherlands following the same track would get the same question. Second, funding isn’t dependent on results of the students. In contrary, schools with lower than expected results can, in some cases, apply for additional funding to improve. (It’s more complex than that, there’s actually a measurement of ‘entry level’ (measured) vs ‘exit level’ (expected). Schools with many students entering at a lower level, e.g. because of a relative high number of (2nd or 3rd generation) immigrants or students with a ‘handicap’ would get additional funding to achieve the same exit level. If exit level drops due to more complex students entering, additional transition funding could be possible for some time). Bicycle hub just opened close to subway station at Hollywood and Vine St.
Only 64 bike parking spaces available. A larger facility with parking for 200 bikes will be built at Union Station. 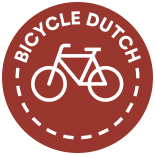 This entry was posted on 16 May 2017 by Bicycle Dutch in Original posts and tagged big bridge, helmet, Royal family, small things, Velo-city.